These Earphones are lightweight and low-profile around-the-neck collar. Bluetooth® wireless with 8-hour rechargeable battery. Call, track and volume control via the built-in microphone and remote. 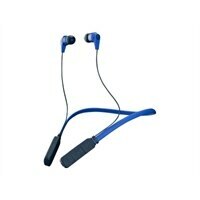 Skullcandy INK'D WIRELESS - Earphones with mic - in-ear - Bluetooth - wireless - noise isolating - navy, royalThese Earphones are lightweight and low-profile around-the-neck collar. Bluetooth® wireless with 8-hour rechargeable battery. Call, track and volume control via the built-in microphone and remote. Thanks to its featherweight design and low-profile fit, Ink'd Wireless won't cramp your style. For easy storage when not in use, Ink'd Wireless' flex collar allows it to pack up to one-third its size. Enhanced by a noise isolating fit, Supreme Sound delivers rich audio across all types of music.